Upon moving to San Antonio fifteen years ago, I had always wondered – in a perfunctory and mildly curious way – why there would be so many boats and wave-runners around. Such watercraft would be parked on a trailer in the street, or in a driveway, or moving purposefully down the road behind a pick-up truck – and I would be wondering where they were going, actually. We are too far from the coast, and as charming as the various local rivers are, unless they are in 100-year flood, there’s no scope for floating anything larger than an inner-tube on them. 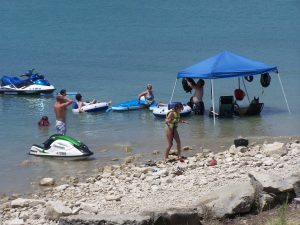 And slightly later, I realized that – that damming of various upstream and down from San Antonio had produced lakes sufficient for recreational boating purposes – and that’s were all these people with boats and wave-runners were headed, every holiday and three-day weekend. 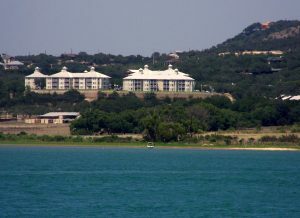 They were going to Medina Lake, Calvaras Lake, Braunig Lake, to Canyon Lake, and Lake McQueeney, and if they were really ambitious, all the way past Austin to Lake Travis. So, my darling daughter decided that she wanted to celebrate this last 4th of July in the water, or close to the water’s edge, and being that the price of gas and a hotel room had pretty well removed an excursion to the Gulf Coast from the equation. 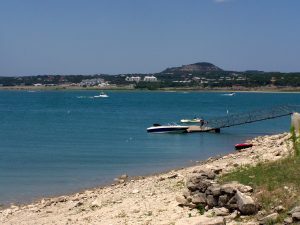 She decided on Canyon Lake, to spend the day there at the day-beach at Canyon Park – and that we would take the dog. Alas, once we got there, we discovered that the day beach was absolutely closed-verboten-no-exceptions-whatsoever to dogs. So, we had to drive around to the campgrounds, and take a campsite for the day, at a slightly higher price, where leashed dogs were permitted. The only disadvantage to that location was that it was really not a comfortable beach – just an agglomeration of rock – and that there was absolutely no shade. The entire stretch of shoreline had no shade, other than metal canopies over the picnic tables at the various sites. There hadn’t been any shade at the beach, either, or so we had observed – most picnickers had brought their own beach umbrellas or pop-up canopies. They were most desperately needed, in any case, for there wasn’t a cloud in the sky – although there was an occasional light breeze, being on a height elevated somewhat above the water. We thought the party next to us – a large group of friends and family also spending the whole day there, rather than camping – had the most clever idea of putting up one of their pop-up canopies in the shallow water, and parking a couple of lawn chairs underneath: in the water, which was barely cool, and in the shade, while they played around with inflatable floats, and a pair of wave-runners. We were rebels to the point of letting the dog swim, off her leash, although I am not sure she enjoyed it all that much, and was reluctant to go into the water at all, unless both of us were already in. And I turned my ankle, negotiating the rocks – so I wasn’t so much keen on risking breaking anything else. But we had folding chairs and a bit of shade, cool water and plenty of sun-screen, so in all – much more pleasant a day than at the beach, and having to drive home afterwards with sand in your bathing suit. Next hot weekend though? I think we’ll tube the river; the shade is more substantial, and I will remember to bring my Crocs . . .